As promised here are some pics from this weekends wool extravaganza! 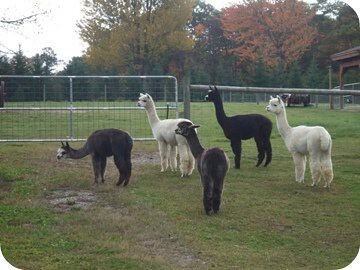 Many are from the NH Wool Arts Tour where we stopped at many different farms including alpaca farms. The alpaca were captivated by the horse and buggy rolling by — clearly these camels were concerned by the size of the horses! 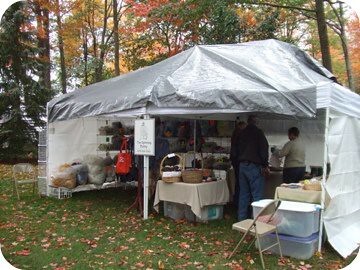 Even though it was cold and windy these ladies had set up their wool shops on the farm property to appeal to the knitters and crocheters among us — which was basically everyone. 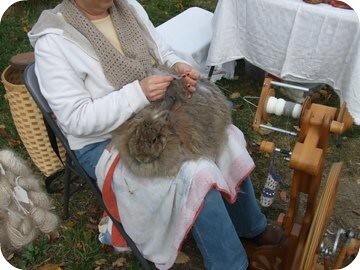 This angora rabbit was getting a “haircut” when we saw it — it’s owner, who has six rabbits, was pulling off its extra fluff and spinning it right there into yarn! They kept each other warm. 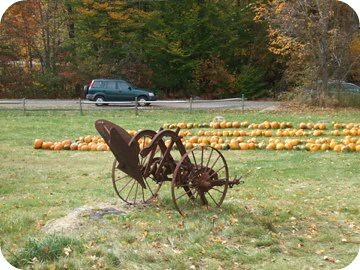 Fall in NH — plenty of pumpkins! We went to five of the six stops on the tour, met with Jennifer from the Mill, got some great ideas for where to source our fiber from AND learned there is a wool shortage in the area so we’re going to need to work fast! 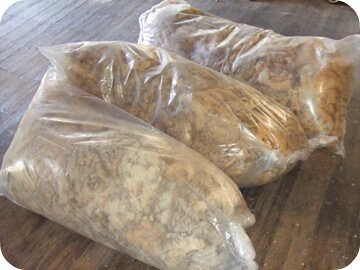 While the weekend was intended to skirt all the wool we already have (200 lbs) that wasn’t possible to complete as we didn’t know the cut off for too dirty to clean…but fear not, we have until January/February to get it all done — I have faith that that’s plenty of time! Thanks to everyone who is sending the Yurt Alert around the internet — I couldn’t do this without you! Pics to come tomorrow when I’m back in New York — keep telling your friends! 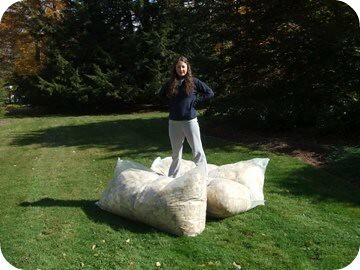 After a layover in New York so I could see what I was working with the wool made it back to New Hampshire! 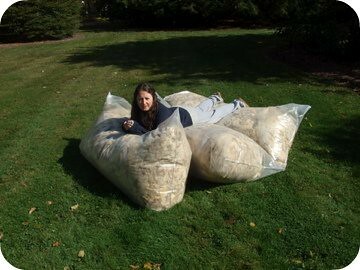 It’s five pounds of wool, half merino and half merino blend, which I ordered from Harrisville Designs to build the prototype for the yurt. 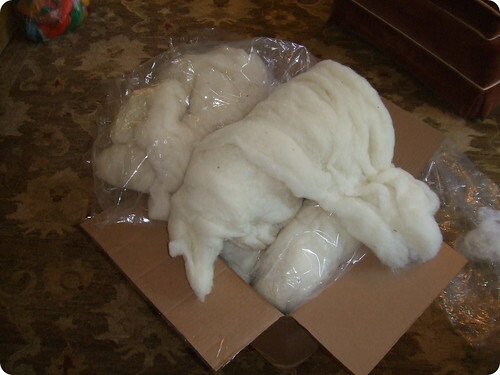 Upon opening the box the wool began to expand out of it’s batts – quickly! The next task is pulling it all apart into little strips and pieces to lay across each other to felt. 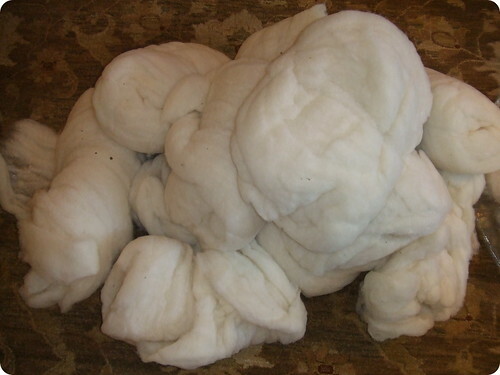 Look how much one batt grows — all ten only took a few days!